PITTSBURGH, Pa. – Sparked by a third-quarter turnaround, the Clemson Tigers (14-5, 5-1) outscored the Pittsburgh Panthers (9-10, 0-5) by 11 points in the second half for a come-from-behind, 65-59, victory at the Petersen Events Center on Sunday. The Tigers have now won five straight ACC games, the longest conference win streak for Clemson since 2000. A fixture of Clemson's hot streak has been heavy bench production and that trend continued on Sunday with the reserves accounting for 29 of the Tigers’ points. Shooting 43 percent from the floor and 76 percent at the free-throw line, Clemson was efficient on the offensive end, but primarily turned the game around via defensive pressure in the second half. Scoring in double figures for the third straight contest, senior Aliyah Collier led all scorers with 18 points off the bench. The guard knocked down a trio of 3-pointers and shot 6-of-15 from the floor in a veteran performance. Fellow guards Simone Westbrook (12) and Danielle Edwards (13) contributed double-digit outings of their own. 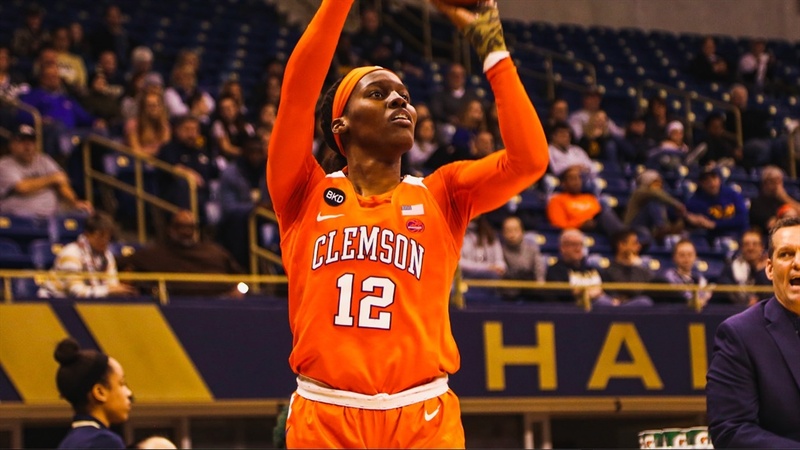 Edwards was a rock at the free throw line for Clemson, shooting a perfect 8-of-8 when her name was called. Pitt used a quick start to take an early 20-16 at the end of the first quarter but freshman guard Camreé Clegg pulled the Tigers to within five just before halftime with a trio of free throws. However, the Panthers stayed hot coming out of the locker room to extend their lead to 12 early in the third quarter. After a media timeout at the 8:28 mark, the Tigers came alive, going on a 14-1 run to take their first lead of the game at 44-43. The momentum swing included 3-pointers on back-to-back Clemson possessions by Collier and Westbrook, respectively. The Tigers entered the final period with a 3-point advantage and maintained their lead the rest of the way. The Tigers' winning streak will be put to the test on Thursday as they remain on the road to take on the No. 8 North Carolina State Wolfpack (18-0, 5-0) at Reynolds Coliseum. Tipoff is slated for 7 p.m. and the game will air on ACC Network Extra. Clemson tallied its fifth ACC victory with a win over Pittsburgh, the longest conference win streak for the Tigers since the 1999-2000 season...The Tigers’ 5-1 start to ACC action is the best conference winning percentage for Clemson since 1997 (min. two games)...Senior Aliyah Collier posted her third straight double-digit outing with 18 points on the night...With six rebounds, Collier moves into 16th all-time in career rebounds at Clemson with 569...Senior Danielle Edwards totaled 13 points to move into 19th in Clemson scoring with 1099 career points...The Tigers are now 7-6 all-time against Pittsburgh and 3-3 when playing in The Pete.